Because I wanted this blog to be a resource to find good eats in restaurants and at home, I am posting the first set of recipes in a series that will focus on frequently overlooked Korean ingredients. 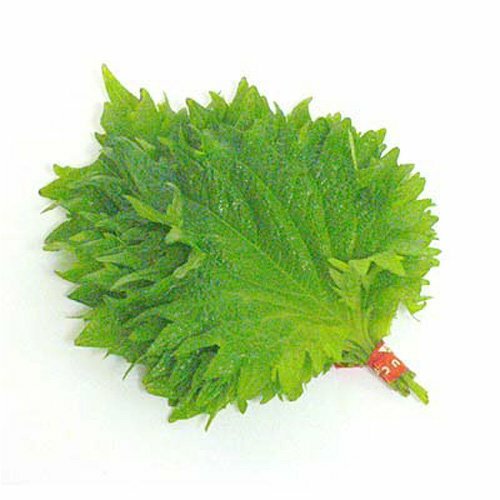 The kennip, is sometimes translated as sesame leaf and other times known as perilla, which is related to the shiso leaf often found in Japanese cuisine. As you can see, they are almost identical in appearance but oh-so-different in taste (photo: Amazon.com). 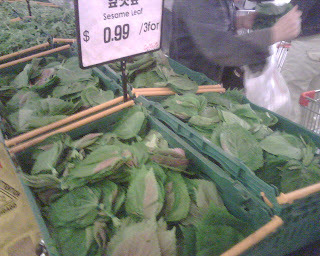 I personally don't care much for the minty and distracting taste of the shiso leaf. Don't add it to my sushi or tonkatsu. The peppery and earthy taste of the kennip, on the other hand, always adds a refreshing layer of flavor and adds crunchiness that rounds up any dish nicely. It's best to eat it raw as part of a salad or as an alternative to lettuce when wrapping juicy Korean barbecue meat slabs with pieces of kimchi. 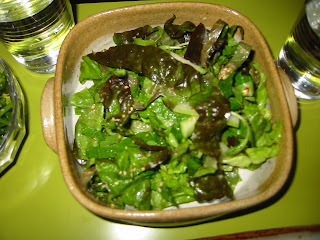 Kennip leaves are less cumbersome to handle than red-leaf lettuce due to their smaller volume and they make for a more interesting combination with the Korean-style grilled meats, whether it's spicy boneless pork bbq or the classic kalbi (ribs). 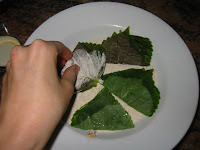 Another way to eat the kennip raw is to use it as a filling for rolls or handrolls. Koreans have a variation of the Japanese sushi roll called kimbab, and we usually use cooked ingredients rather than raw fish like in Japanese rolls. The tuna kimbab is yet another twist to the traditional standard meat variety, both of which feature omelette strips, cucumber or spinach and carrot strips as fillings squished amid slightly salty and vinegary short-grained rice -- all wrapped in unseasoned extra crunchy toasted seaweed sheets. All you do is lay out two leaves of kennip over the rice that is spread on the seaweed, and then pile on the fillings like you would with a standard kimbab. If you don't feel like making a production out of the kimbab, which it often can become, just cut the seaweed sheets into 3x4 (or half of the size they come in the packages) rectangles, spread the rice, place the kennip over the rice, get some canned tuna (I like the standard Dongwon brand you can buy in Korean markets) on it, throw in some cucumber strips, roll it, and you have yourself a magnificent handroll. If you just want a cool summer salad, shred some red leaf lettuce, slice 1/2 a cucumber and cut about 10 kennip leaves into thin strips. Excuse the cliche, but I should disclose that I have never used a measuring device for these recipes, as I learned to make them looking over my mother's shoulder. I credit her for much of the Korean dishes I will be sharing here. Consider this a disclaimer that the measurements are "ballpark." For the dressing, mix about 1/4 cup of rice wine vinegar with 1/2 teaspoon of vegetable oil, 1 Tablespoon of sugar and 1/2 teaspoon of Korean red pepper flakes (kochukaru), sprinkled with 1 Tablespoon of toasted ground sesame seeds. 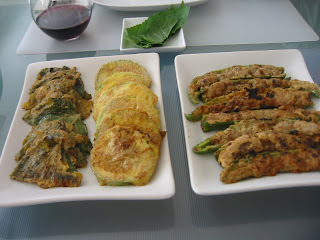 If you feel like making something more elaborate, try the classic kennip jun, which is kennip stuffed with a ground meat mixture, coated in flour and dipped into egg batter, before hitting a medium-high heat pan to fry (use plenty of vegetable oil). 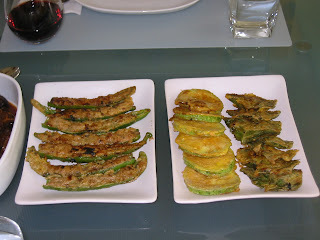 Pictured left is a trio of jun including zucchini, green peppers and kennip jun, all stuffed with ground meat. 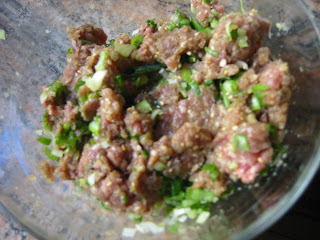 You will need about 1/4 pound of ground beef, 1 Tablespoon of soy sauce (I use low-sodium), 1 Tablespoon of sugar (or substitute with maple syrup), 1 Tablespoon of minced garlic, 1 teaspoon of toasted ground sesame seeds and 1 teaspoon of minced green onions. 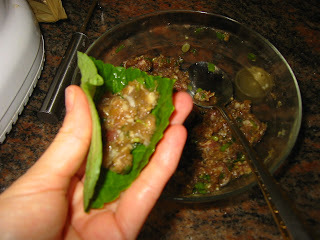 Mix all the ingredients together and place 1 teaspoon of the mixture into one kennip leaf and fold the leaf into half. Repeat with the remaining kennip leaves. 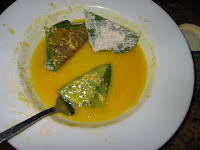 Coat the stuffed kennip with flour first and then dip it into the egg batter before pan-frying them. Heat canola oil or other vegetable oil into a pan and fry in medium-high heat. 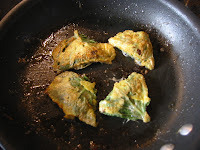 If you have more of the meat mixture than kennip leaves, make small patties out of them and pan-fry them after coating them in flour and dipping them in egg batter. You have now created the venerable dongerang-teng, a wildly popular side dish. Even in the early morning hours, the food looks good . . .
omurice whaiting! the home stretch. sugohe! gracias, azinku. i'm working on it. how come you haven't sent any pictures of you know who? we want IS! we want IS!